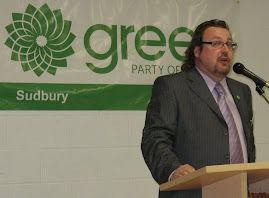 Sudbury Steve May: W Minus 40: A Golden / Green Moment for us to Seize! W Minus 40: A Golden / Green Moment for us to Seize! Some interesting news from one of my least-favourite polling companies, Harris-Decima (least favourite only because Green Party numbers tend to be lower in their polls, not necessarily because I have any concerns with the nature of their polling). Sunday’s Globe and Mail reports that Canadians are not in a mood to have environmental issues trumped by the need to prop up our economy. I find this interesting, although not particularly surprising, as it has seemed to me that the mood of Canadians has changed in the past couple of years when it comes to the environment. Certainly, there has been a growing sophistication and understanding that we need to start taking action to address the growing climate crisis. The other interesting news out of Harris-Decima are results from a poll released August 20, 2009, in which it is reported that a majority of Canadians want to see Elizabeth May become a Member of Parliament, and want to see the Green Party play a more important role in Canadian politics. This poll in particular is really exciting to me, although again I can’t say that I’m surprised with its outcome. I’m excited, though, that the topic itself was interesting enough for Harris-Decima to look into (even if it was during the dog-days of August). I’ve seen Elizabeth May’s name mentioned in the media a little bit more lately, which has largely been a good thing. Even today’s story in the Globe and Mail about Elizabeth’s eyeing a so-called "winnable" seat in B.C. emphasized some of the positive aspects of our Party, including the grass-roots democratic notion that even the Leader can be challenged in a local riding for the candidacy. The more these sorts of stories are shared with Canadians, the better our Party will look to those concerned about the state of our democracy. Indeed, coverage of this sort, supported by polls, will only lend legitimacy to our Party during the next election, and to Elizabeth May’s call to be included in the televised Leader’s debate. While I do not agree with Stuart Hertzog's decision to campaign for the candidacy in SGI at this time, I respect that in our Party, he has every right to do so. In the run-up to Copenhagen, we will start to see more media coverage with environmental messages. As candidates become nominated throughout Canada, Greens have an opportunity to share messaging about the environment and the economy with local media who are interested in discussing how environmental issues might play out in our local communities. Let’s make a concerted effort to introduce our local candidates to local media, and offer the local media our own expertise should the need for a quote, comment, or op-ed piece arise. Keep in mind that the International Day of Climate Action is taking place on October 24, 2009 (a Saturday). This might be another date to mark on calendars, to be used to engage local media and introduce candidates to the electorate (if we’re not already in an election), or to reinforce Green Party messages (should we be in the midst of an election campaign). As the dog-days of summer are wearing thin, and people’s minds begin to slowly turn to the serious issues facing our nation, Greens might yet come out of this summer re-invigorated. Let’s not lose site, though, of ensuring that all EDA’s have candidates selected to run in the next election. And let’s not forget that the Campaign Committee has developed a plan which it needs to share with EDA’s and local candidates in an effort to kick-start the messaging which Greens will have to promulgate over the next 40 days (and nights). This is our time. This is the Green Party’s chance to seize our opportunity, and to run with it. Let’s not waste this golden/green moment. Steve, much of the media coverage and polling also points out that the GP has to move beyond climate change and the environment as issues. Re "Elizabeth May’s call to be included in the televised Leader’s debate." But there is no desperate pooch waiting in the wings this time around to allow that to happen (as there is no dead-beat deal about to be cut to allow for electoral theft). Anon, John and Sebastian, thank you for your comments. Sebastian, I agree that having E. May in the debates is going to be an absolute up-hill battle this time around, as I don't see a compelling reason for the media consortium to invite her. Gains in the popular vote alone are not "results" in the eyes of the voters, and certainly not in the eyes of the media either. A lack of results in the last election, coupled with a new strategy which is going to see our Leader put all of her efforts into winning in SGI at the expense of touring the nation on a national campaign will side-line her ability to muscle her way into the debates. Perhaps, though, we will be able to turn that around locally, and build on some of the undercurrents which are out there. Local campaigns can point to the media and the other parties and say that they believe we are dangerous, and that they are shutting us out. To do so effectively, though, we need a strategy. I hope that the Campaign Committee has developed the strategy for this contingency. It would be very unwise to presume that she'll be in the televised leaders debate. John, I realize that the polls indicate that Canadians want to hear more about us than just our environmental policies, and I think that's encouraging. Interestingly, I've been an advocate on the GPC blogsite for a different approach: focus entirely on the environment in the next campaign, using our limited resources to get that message out at the expense of all others. Looks like my championed approach could prove to be wrong-headed. Not that I'm worried that the Campaign Committee will have focused on a single issue anyway. But I do hope that we present between 3 and 5 main messages only this time around, trying to keep our candidates focussed on those messages. But it's August 25th, less than 40 days from the Writ dropping (if it does so on October 4th), and we've yet to see the details. We've got candidates thrashing about, wondering what the messages are going to be, what resources are going to be made available to them, etc. What are we all waiting for? I am growing frustrated. I thought that the poll results were woefully underplayed and received almost no media attention - let alone political discussion.